Sunrise Technologies is very excited to share special pricing for existing Dynamics customers. If you are an existing Dynamics CRM or AX on premise customer (in good standing!) then you may be able to take advantage of a 40% discount if you switch to Dynamics 365. This discount offer allows you to unlock features across Sales, Customer Service, Field Service, Project Service, and Operations — including PowerApps and Power BI. THE FINE PRINT - As of November 1, 2016, existing Dynamics customers can buy Dynamics 365 with a 40% discount for 3 years. This includes any users added between now and then, not just the license counts prior to the transition. On November 1, 2019, subscription pricing will return to the traditional 15% discount. There are two ways current customers can take advantage of the discount. You can either continue to pay maintenance (BREP) just as you have every year while also paying for a Cloud Add-On package for each user, or you can completely switch from a Software Assurance (SA) or BREP user licenses to the full Dynamics 365 user license, also known as a "from SA" option. The 40% discount applies to the cloud add-on and the "from SA" option and can be purchased on an existing Enterprise Agreement (EA), or a new month-to-month cloud plan from Sunrise. For current CRM and AX online customers, you can choose to stay on your current plan until the end of your agreement or you will have the option to transition to the new Dynamics 365 at your anniversary. For current AX and/or CRM on premise customers, you can choose to continue BREP or SA and stay with your on premise deployment. However, if you're ready to migrate to the cloud, you can do so via a cloud add-on or "from SA" product. You can act any time if you choose to keep paying BREP or SA and would like to move to Dynamics 365 using the cloud add-on. However, if you wish to move from your current plan to a Dynamics 365 subscription, you'll have to move to a subscription only plan at your anniversary or renewal. Existing AX 2009 customers must first transition from concurrent users to named AX 2012 users. Then cloud add-on or "From SA" transition licenses can be applied. Just contact us and we can help you see how many named users you will get for existing concurrent users. What's the difference between a "cloud add-on" and "from SA" transition license? A lot actually! But the good news is both of these options acknowledge your existing investments. Cloud add-ons are optimal for customers who are at the beginning of their cloud journey and want to move part way through an existing agreement. Cloud add-ons are a simple, low-cost way for customers to add Dynamics 365 services at any time while maintaining their current Enhancement benefits. Customers are not required to change their existing agreement. "From SA" transition licenses are applicable for customers who want to move all of their users to the cloud and drop the Enhancement Plan. "From SA" is only available at anniversary/renewal for customers with fully-paid perpetual licenses. Subscription customers with at least 3 years prior investment are also eligible. You can buy "from SA" and cloud add-ons at the same time. If you move some licenses from perpetual using the "from SA" option and also keep some perpetual licenses and use the cloud add-on transition license, the maintenance would be reduced going forward. Who wants to deal with multiple vendors, bills, support lines, or billing cycles? Nobody we know (although if that’s your thing, you do you.) 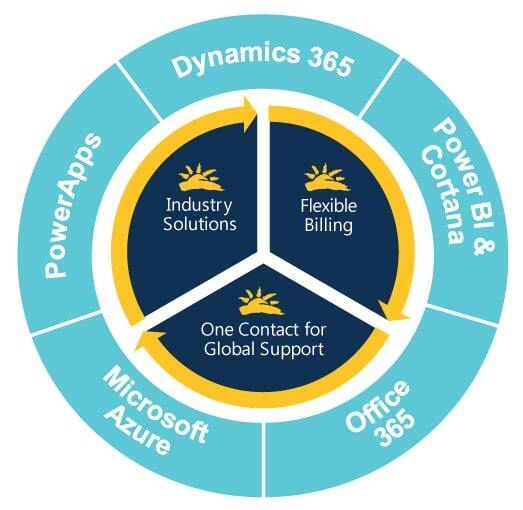 By choosing to implement via CSP, Sunrise becomes your one-stop-shop for purchasing, deploying, and supporting Microsoft intelligent cloud solutions like Dynamics 365, Power BI, Power Apps, Cortana Intelligence, etc. We would also be your first point of contact for planning, implementing, and supporting end-to-end cloud solutions with our embedded industry enhancements. You would only receive one bill that is all-inclusive of the Microsoft and Sunrise services you buy. And you're not locked into any particular seat count either. You can add or remove seats at any time, taking full advantage of the flexibility of the Microsoft Cloud. Ready to take advantage of your discount? Contact us today!